Is the Tory Party Chairman guilty, lucky, or innocent? In this new era of relativist ethics, it is of course jolly important for the Law to move with the times, or even The Times. Or rather, it is if you’re a complete idiot. We have a most confusing – more accurately, deliberately muddled – issue relating to the guilt or otherwise of a prominent Conservative MP at the moment. 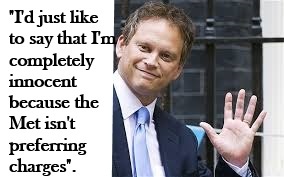 His name, you will be unsurprised to learn, is Grant Shapps. A man who – despite his long track record of being a dissembling arse – is Chairman of the Conservative Party. The Daily Telegraph this morning reports – with what I took to be a straight face – that “A business deal involving a company set up by Grant Shapps, the Conservative party chairman, ‘may constitute an offence of fraud’, Scotland Yard has said”.